This fall the Morgan devotes two galleries to an extraordinary exhibition of rarely seen master drawings from the Staatliche Graphische Sammlung, Munich, one of the foremost collections in Europe. Dürer to de Kooning: 100 Master Drawings from Munich showcases their significant holdings with exceptional examples by Italian, German, French, and Dutch and Flemish artists of the Renaissance and Baroque periods; German draftsmen of the nineteenth century; and an international contingent of modern and contemporary draftsmen. This exhibition marks the first time works from the renowned graphics collection in Munich have been shown in the United States. 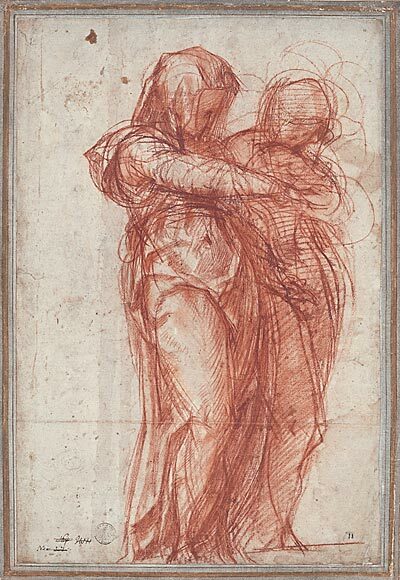 Spanning the sixteenth through twentieth centuries, works on view include, among many others, drawings by such celebrated old masters as Michelangelo, Pontormo, Raphael, Titian, Dürer, Matthias Grünewald, Holbein, Rubens, and Rembrandt; nineteenth-century sheets by artists including van Gogh, Caspar David Friedrich, and Adolph Menzel; and modern and contemporary works by Beckmann, Picasso, Hockney, Baselitz, and Polke. Major funding for this exhibition is provided by Karen H. Bechtel, the Anna-Maria and Stephen Kellen Foundation, and an anonymous gift. Generous support is provided by Stiftung Ratjen and by Kurt F. Viermetz, Munich. Lead corporate sponsor is Morgan Stanley. Two Standing Women, after 1530?